David Flood is a graduate of Dun Laoghaire’s Institute of Art, Design and Technology’s in Dublin, Ireland where he has also studied Visual Education. He now lives and works in Helsinki where he teaches photography in the Espoo Adult Education Centre near Helsinki. While in Ireland he taught at the Gallery of Photography in Dublin as well in Dun Laoghaire College of Further Education. His work has been exhibited at RuaRed’s inaugural summer show in Dublin in 2009 as well as at the Mid-Summers Festival in Cork in June 2011. His work in the permanent collection of IADT Dun Laoghaire, Ireland. 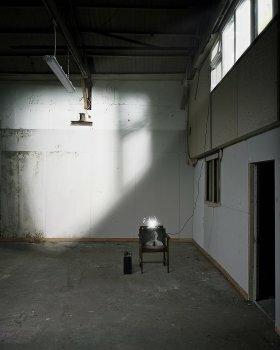 At his graduate show the series 'The Cage's Keeper' was recognised with the IPPA 2010 IADT Student Award. ‘The Cage’s Keeper’ work has also been published in both BLOW and F-Stop photographic magazines in 2011. The overall perspective of his artwork is to attempt to show the viewer a world that has been constructed rather than grown naturally. These constructions exist on both a physical and psychological level and are thus created in order to mould our consciousness in a certain way. With the constructed imagery used in ‘The Cage’s Keeper’ he believes that this suggests another kind of truth, or at least the constructed nature of everyday reality, thus helping to uncover the insecurity that exists between the ‘real’ and the ‘reality’ of the photographic medium.